The “Working for Dignity” research project started when the California Rural Legal Assistance noticed “that a lot of workers were coming from agriculture and moving into low-wage services but they hadn't seen any documentation or research so they asked us, in order to improve their services, they wanted to know what's going on with this trend and what are working like," said McKay. According to McKay, Espinoza and Arias, like many other students working on the project, are able to acquire better data because of their common background and language with the population being studied. 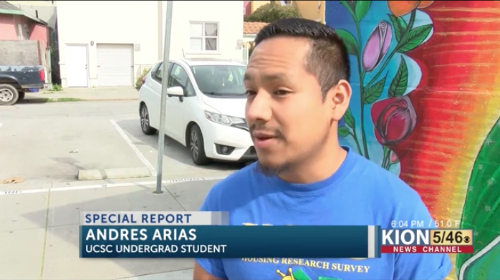 "I'm serving people like myself and I'm interviewing people like my parents who are also low wage" said Arias. "Thirty-eight percent of the people we talked to didn't get paid overtime. Half the people we talked to didn't get legal breaks and so this kind of wage theft was going on," said McKay, explaining the results found in the study. "So CRLA and the community action board were able to show this research to the county of Santa Cruz who then gave them funding to have monthly wage clinics." 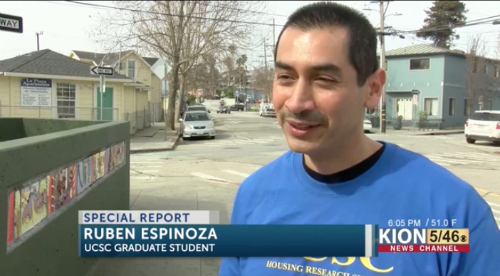 Recently, McKay launched “No Place Like Home,” a research project studying the affordable housing crisis in Santa Cruz County.